JOTMAN: Is Obama really a friend of the developing world? Is Obama really a friend of the developing world? If you believe that either solving the global food crisis or preventing global warming should top the agenda of world leaders, then Obama may not be the US presidential candidate best positioned to deliver results. Ethanol is one area in which Mr. Obama strongly disagrees with his Republican opponent, Senator John McCain of Arizona. . . they offer sharply different visions of the role that ethanol, which can be made from a variety of organic materials, should play in those efforts. If the NY Times article is to be believed, Obama continues to favor ethanol subsidies to US farmers in spite of the recent food crisis. On the other hand, McCain has a track record of standing against biofuel subsidies to US farmers. Most tellingly perhaps, McCain said he would have voted against the recent farm bill, whereas Obama said he would have supported it. (As they were both campaigning, neither showed up to vote). Would President Obama be a genuine friend of the developing world? Or is Obama mainly devoted to transferring US taxpayer dollars into the pockets of the US corporations who have sponsored him? At a time of world food shortages, the once obscure issue of ethanol subsidies raises big questions about Obama. Does the NY Times article fairly reflect Obama's position? Expand Locally-Owned Biofuel Refineries: Less than 10 percent of new ethanol production today is from farmer-owned refineries. New ethanol refineries help jumpstart rural economies. Obama will create a number of incentives for local communities to invest in their biofuels refineries. Establish a National Low Carbon Fuel Standard: Barack Obama will establish a National Low Carbon Fuel Standard to speed the introduction of low-carbon non-petroleum fuels. Increase Renewable Fuel Standard: Obama will require 36 billion gallons of renewable fuels to be included in the fuel supply by 2022 and will increase that to at least 60 billion gallons of advanced biofuels like cellulosic ethanol by 2030. Invest $150 Billion over 10 Years in Clean Energy: Obama will invest $150 billion over 10 years to advance the next generation of biofuels and fuel infrastructure. . . Double Energy Research and Development Funding: Obama will double science and research funding for clean energy projects including those that make use of our biomass. . . .
Renewable Fuels: Obama has worked on numerous efforts in the Senate to increase access to and use of renewable fuels. Obama passed legislation with Senator Jim Talent (R-MO) to give gas stations a tax credit for installing E85 ethanol refueling pumps. Fully one quarter of Senator Obama's energy/environment plan - 6 of 21 policy points -- read like a strategy to enrich the biofuel lobby. Has no Obama advisor read a newspaper in the past six months? Two recent developments should have caused the Obama campaign to rethink the candidate's support for biofuels. First, two major studies by climate scientists found that biofuel is a net contributor to both global warming and deforestation regardless of where a particular biofuel crop happens to be grown. Second, from Kenya to Indonesia poor people have been protesting high food prices. The law of supply and demand says that continuing to subsidize biofuel production in the United States contributes to higher food prices worldwide. The question begs to be asked: Is Senator Obama sincere about strengthening America's ties to the developing world and saving the environment? John McCain Will End Policies That Contribute To Higher Transportation And Food Costs. Ethanol subsidies, tariff barriers and sugar quotas drive up food prices and hurt Americans. People living in the least developed countries need a US president willing to stand up to Congress and put an end to US biofuel and agriculture subsidies. For everyone on the planet, the question of selecting the most effective tactics to counter global warming is paramount. The respective responses of the two candidates to these questions could not be more different. Photo: by Jotman. 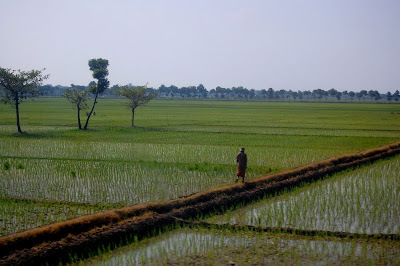 In central java, a rice farmer walks across his field.